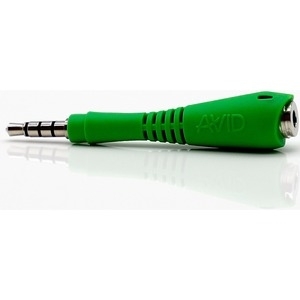 The Fishbone TRRS adapter is AVID’s response to the pin breakage problem experienced across the audio industry by companies of all sizes. This flexible breakaway TRRS adapter helps prevent pin breakage inside expensive electronic devices when a student pulls mistakenly yanks the cord when standing rapidly or when a device falls on the ground. Inspired by the swimming motion of fish, the Fishbone bends in the middle across the ribs while rotating in the device’s jack. This flexand- bend reorients the Fishbone’s jack in the direction of the pulling force allowing the headphone pin to disengage without causing damage. Available in black, the Fishbone is part of AVID’s targeted approach to increasing time on learning by reducing technology failure. This product complies with applicable CPSIA and TPCH regulations.